Sculpture of Roman god Janus in Summer Garden, St Petersburg, Russia. 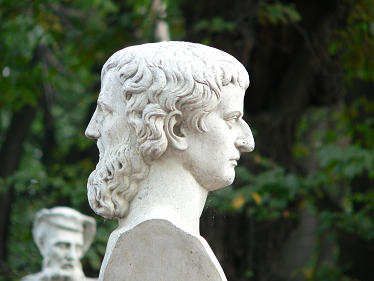 According to Roman mythology, Janus could see both future and past. Learning is the ability to make inferences from repeated events (observations), in order to predict or anticipate future events. Two inter-related characteristics of learning, i.e.the ability to explain the past and predict the future, have been known since ancient times. However, quantitative models for managing uncertainty and risk have been developed fairly recently in the 20th century, due to advances in computer technology and mathematical tools in statistics and machine learning. Professor Cherkassky's research is concerned with methodological, technical and practical aspects of predictive learning. Most existing methods for learning from data are based on standard inductive-deductive approach, comprising two distinct steps, induction, when a predictive model is estimated from past data, and deduction, when an estimated model is used to make predictions with new inputs. Many challenging new applications of data-driven learning deal with heterogeneous and high-dimensional data. For example, in medical diagnostic applications, patients’ features include genetic, clinical, demographic and imaging data. Such applications may require alternative (non-standard) learning methodologies. Our current research investigates several emerging non-standard learning approaches for predictive modeling, including their mathematical formulation, development of practical strategies for model complexity control (aka model selection) and several real-life medical applications. Page generated 2016-05-06 11:05:13 CDT, by jemdoc.